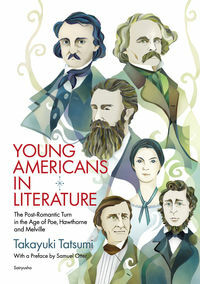 YOUNG AMERICANS IN LITERATURE The Post-Romantic Turn in the Age of Poe, Hawthorne and Melville. moments of intriguing transnational intertextuality. Literary Landmarks from Walden Pond to Wounded Knee. and influences that continually astound, amaze, amuse—and convince. to the theory and practice of expansive American Studies. Professor of English at Keio University. “”"”The Murders in the Rue Morgue”"”"